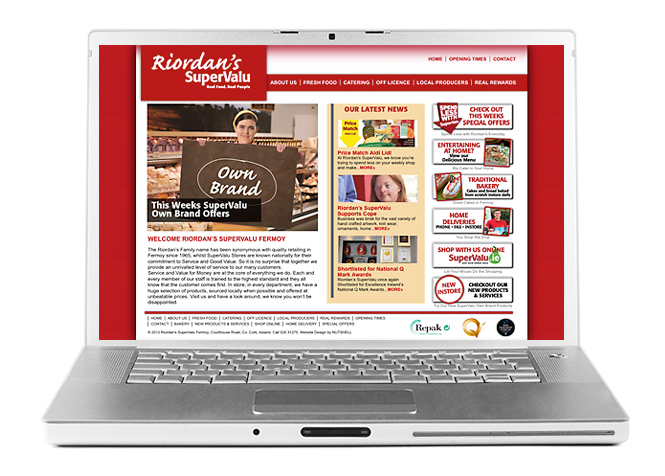 Riordan's SuperValu, based in Fermoy, Cork website released into the wild (September 2012). Built with ExpressionEngine. The gallery on the home page is built with wow slider (www.wowslider.com) and gives a nice dynamic feel to the home page. The website design keeps within brand guidelines with the attractive red and white colour palette. Great to see a SuperValu store have its own unique website where the company can showcase its special offers, latest news, history and services. This gives Riordan's SuperValu a unique feel yet retains the overall SuperValu brand.